When you’re out in the wilderness the last thing you want is to end up lost, alone and uncertain what to do to next. That’s where the best survival watch comes into play. With plenty of features that you’d expect from a normal watch and plenty of features that are definitely unique, you don’t have to worry about a thing when it comes to options with this survival watch buying guide. 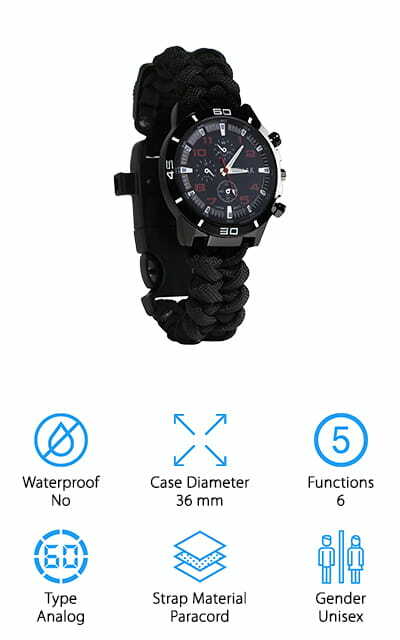 Waterproof: Having a waterproof case for your survival watch is definitely important because you never know where or when you’re going to need to use it. Knowing you’re still protected even in the rain is going to be crucial. Case Diameter: Before you get the watch you’re going to want to know just how large it is. Depending on the size of your wrists you may want to go with something slightly smaller or something a little larger. Functions: Just how many things can that survival watch do? Is it only going to do the basics or can it carry out more advanced functions as well? Knowing before you buy can help you be prepared when the time comes. Type: This is mostly a personal preference but do you prefer a digital or an analog watch? Either way, you’re going to have the same features; you’re just going to have to read your watch differently, so what’s going to be easier in a pinch? Strap Material: Is it made with a type of plastic? A metal band? A paracord band? Maybe you have a personal preference for one over the other or maybe you just want to know so you’re prepared. It will affect overall comfort. Gender: Is it designed for women, men or both? The size and the shape of the watch may be different depending on just who is expected to be using it so pay attention to the recommendation but know you can get anything you like. When it comes down to it there are a large number of different survival watches that you can choose from. You may even be surprised at what is all out there. But we’ve done a lot of the work for you. We’ve narrowed things down to the top 10 and created these survival watch reviews so you can prepare yourself for anything that might be out there. 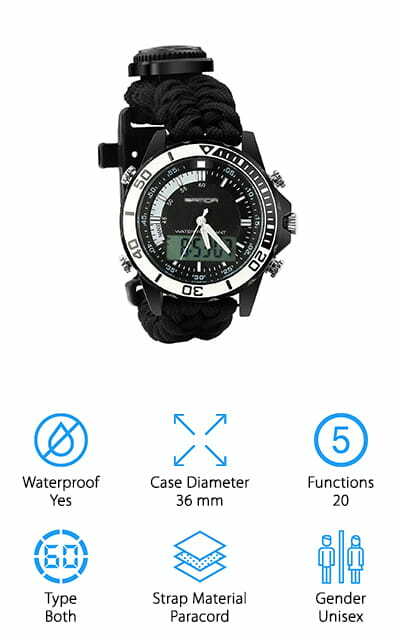 Our top pick is the BlueStraw Survival Sport Watch which features a military dual dial watch with 5 different time patterns and 3 interchangeable wristbands. It’s an electronic watch that provides you with weeks, date, alarm, hour alerts, LED backlight, and two different paracord bracelet bands. Each of these bands is made with 550 paracord so you are ready to take care of just about anything. The first paracord strap has a whistle, fire starter, scraper, compass and thermometer while the second has aluminum foil, alcohol pad, fishing weights, scraper, fire starter, fishing hook, fishing lines, tinder, fishing swivels, floats, whistle, brooch and thermometer. The third strap is made with silicone for your personal comfort. 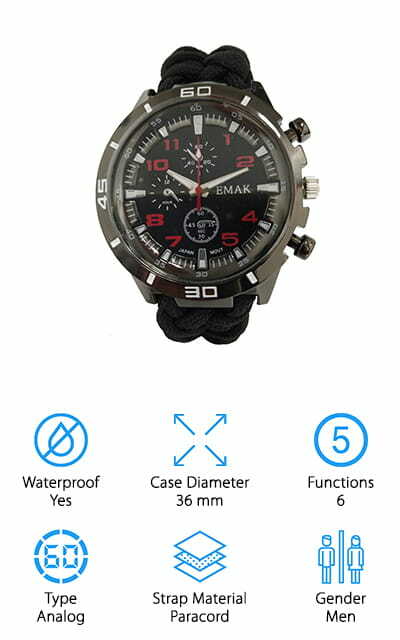 Even better, the watch is water resistant and waterproof to 98 feet (30 meters). Great for just about any activity, this survival watch with compass will make sure you’re ready to do anything. Our budget pick is the best cheap survival watch for sale that gives you a few options to start out with. You get to choose between 3 different colors of paracord for your personal preference. Each wristband is made with 12 feet of 550 lb. paracord and can be used for marking trails, fishing or trapping. It’s water resistant to 5 ATM, which means that it can be submerged up to 15 minutes. It’s also backlit so you can see it even when it gets dark or the weather is less than ideal. Included in the watch are a magnesium flint rod fire starter, a scraper, a compass and a whistle. That means you shouldn’t have a problem getting things done and taking care of any emergency that you come across. Everything you need is easy to access and is a great women and men’s survival watch. It’s also lightweight so you’ll barely even notice that you’re wearing it while you head out into the wilderness (until you need it of course). Next up, we have another great option for a survival wrist watch that gives you 6 different functions including a military grade watch, compass, fire starter, tinder, and whistle. It’s available in 4 different colors and is made with 3.6 meters of 550 lb. nylon paracord. If you need it all you need to do is unravel the cord, which takes seconds to accomplish, and you’ll be able to use it for shelter, trapping, fishing or anything else you need. There are even fishing hooks included in the set so you have a little of everything to keep yourself going. This analog watch does not adjust but it can help you accomplish a lot without even having to take it off. 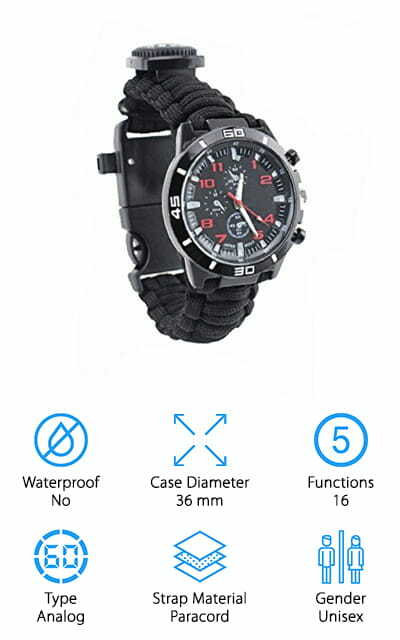 It’s a waterproof survival watch to approximately 10 meters and includes a Celsius temperature gauge so you can keep a closer eye on the weather around you. It’s designed to have a cool look and feel for anyone that wants to head out into the wilderness. This watch is inexpensive and comes in 3 different colors, with 6 different features to help you along your path. 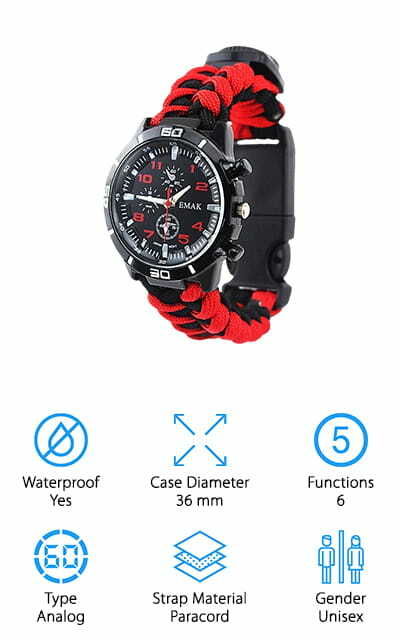 It has a paracord bracelet that provides plenty of different features no matter what your needs may be and it has a whistle, fire starter, scraper, compass and thermometer alongside the watch itself. You’ll be able to keep yourself informed about everything going on around you and prepare for what may come as well. Designed for men and women, it is not waterproof but does have a great look to it and is made with 3 meters of 550 lb. paracord. You’ll definitely be safe with this set that has a stainless steel fire striker that can actually be used as a knife and a magnesium flint rod. No matter what your needs you’ll be ready to go and without having to worry about weight either. That’s because it’s super lightweight and easy to carry. You’ll get a whole lot of features in this inexpensive survival watch because it actually has 16 different pieces to it. You’ll have tinder, fishing lines, compass, thermometer, whistle, fishing hooks, brooch pins, floats, weights, swivels, alcohol pad and aluminum foil as well as the paracord for the watch itself. The 550 lb. cord will give you 12 feet of length when unraveled and can be used quickly and easily. The great look and easy style of the watch mean you can get any features you need. If you need to unravel the cord it comes apart easily but also holds firm when you need it. This set of emergency tools is lightweight and therefore even easier to take with you wherever you need. It can be a little stiff but holds everything you’ll need. Just latch it around your wrist and forget about it until you actually need it. This survival watch is a little less sleek and a little bulkier but it definitely has some great features to go along with it. The watch face itself is easy to read and the gear is easy to access as well. The 3 meters of paracord that make up the wristband itself are going to help you in case of just about any emergency. The scraper is able to be used as a knife as well, and you’ll have a whistle and compass that help you stay on track no matter what. Adjustable as needed, this band can also be attached to your bag so it works for anyone, even smaller children. The analog watch is dark in color, which makes it unobtrusive and ensures you can protect against glare. It even has a thermometer to make sure you know the temperature around you and the bracelet comes in solid black. This watch is moderately priced and comes in 3 different colors that suit your own personal preference. 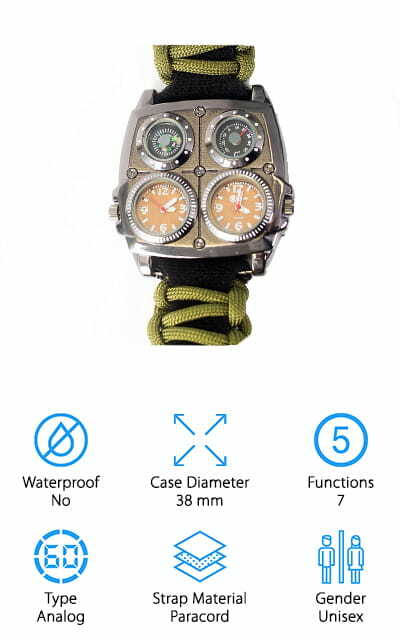 Even better, it gives you both an analog and digital survival watch, a timer, compass, light and a whole lot more. The wristband itself is made with paracord you can use for absolutely anything including first aid and setting traps. Complete with a striker, flint, and more, this is definitely a watch that you can count on. It even has a sleek survival bracelet watch design that you’re going to love wearing, whether it’s for an emergency or for every day. 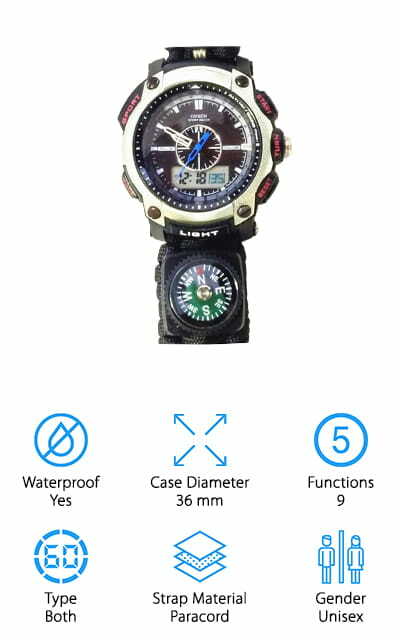 The heavy duty watch itself is waterproof to 30 meters and shock resistant, so you don’t need to worry about how to take care of it in the wilderness. The analog and digital watch features combine with tinder and fishing line to make sure you’re prepared to get yourself safe and secure, no matter what happens around you. This watch is one of the best cheap survival watch options one that gives you 6 different options in a simple to use watch. It comes in 2 different colors and offers paracord for the band, a whistle, compass, thermometer and fire starter/scraper. The paracord is made with a military grade nylon that is 3 meters in length when unraveled. Even better, it’s able to support up to 400 jins. Use the paracord for things like camping or first aid and all of the other tools for other emergency situations. Designed for everyday wear or for you to take in the wilderness the next time you head out you’re going to have no problem wearing this lightweight watch. It’s simplistic but definitely still capable and offers 7 inner ropes to the paracord to make sure you can use it for a range of different features. At 10” in length when formed this is definitely a watch you’ll appreciate in an emergency. This watch definitely looks unique and you’re definitely going to love it too. It comes with 2 water resistant watches actually on one band and you can pick between 2 great colors for which set you want. 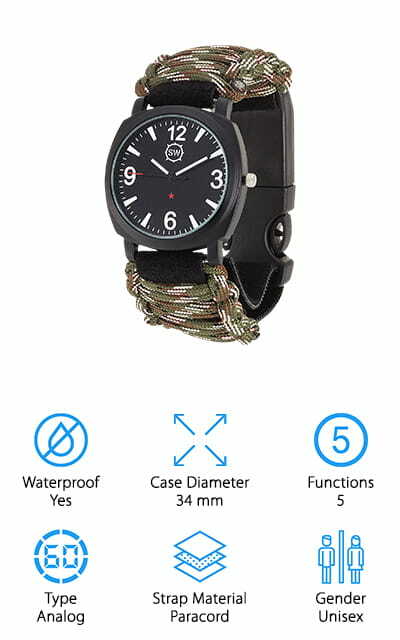 On the watch is a compass, thermometer, whistle, knife, striker & flint and the paracord that makes up the bracelet itself. It even has an adjustable band, which is difficult to find in a paracord bracelet and clips together easily. With this best survival watch for sale, you’re not going to have to spend a lot to get some great functions. Whether you’re heading out into the wilderness or you’re looking for something you can wear around town every day you’re going to have no problem with this watch and all of its features. Not to mention the weight of it is perfect for any of your needs. It even comes with a 1 year warranty in case anything happens. This outdoor, survival watch is going to look just like your regular watch until you see all of the cool things that are hidden inside of it anyway. 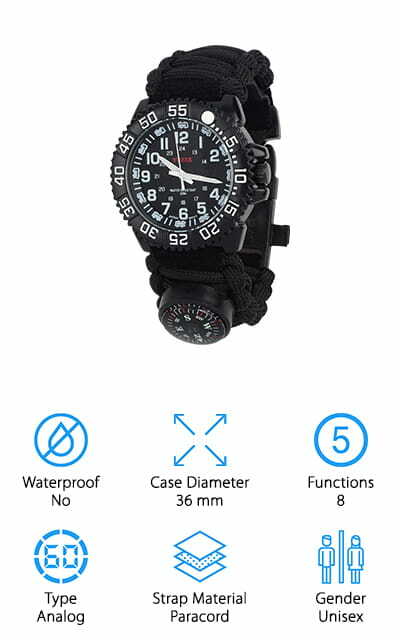 It’s inexpensive and has 6 different features including the watch itself, the paracord it’s made from, a fire starter, scraper, whistle, compass and thermometer. That means you can stay prepared for the weather and for an emergency all at the same time. The whistle creates noise up to 100 db., the thermometer tells temperature in Fahrenheit and it’s waterproof. In case of an emergency, you can unravel the paracord and you’ll be able to do just about anything. This watch is large and still lightweight, so you can wear it comfortably, even if you’re not going to be heading out into the wilderness at the time. All you need to do is strap it on your wrist and you’ll be prepared to head out.